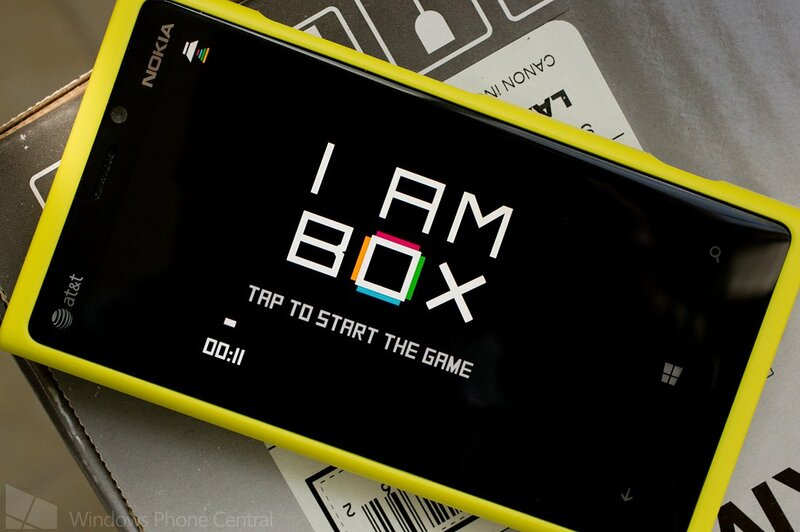 I am Box is one of the simplest Windows Phone games out there. But you shouldn't mistake simple with easy because I am Box can kick you to the curb. I am Box is a fast paced game of survival calling you to catch incoming colored arrows with the side of a box that has the matching color. The longer you survive, the better. The colored arrows enter the screen slowly but as they move closer to the cube, they speed up. You spin the cube clockwise and counter-clockwise by tapping the left or right corner of the screen. As you can guess, when the first arrow strikes a non-coordinating color the game ends. Your score is your the time you survive before matching the wrong colored arrow. Graphics are simple, game play is very challenging (either that or I have the coordination of a Bull Moose) and the music intense with I am Box. The developer recommends wearing headphones to get the full effect of the music. I can see I am Box being a fun "pass and play" styled game when you're hanging out with friends to see who can last the longest or when you have a few seconds to waste. There is a free trial version available for I am Box with the full version running $.99. You can find I am Box here at the Windows Phone Store. It is available for both Windows Phone 7.x and 8 devices.